Barron's. TOEFL Strategies and Tips. Barron's Ed. Series: 2015, 2nd. ed. - 464p. Many books help you prepare for the TOEFL, but this book is different from all the others. TOEFL Strategies and Tips: Outsmart the TOEFL iBT helps you prepare for the TOEFL before you take the test and it helps you outsmart the TOEFL while you are actually taking the test. How is this possible? By using this book, you will learn the strategies that you need. A strategy is a way to think, plan, and outsmart the opponent. When you take the TOEFL, it is you against the test. This book contains 100 strategies based on the most current TOEFL formats. 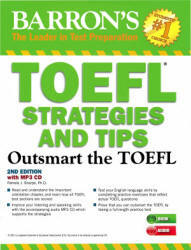 The strategies are tips, tactics, and tricks to ouismart the TOEFL. The tips provide advice on what to do for certain situations that arise during testing. The tactics show you how to approach the most commonly tested questions. The tricks give you the advantage of knowing how raters who grade the TOEFL want you to answer.